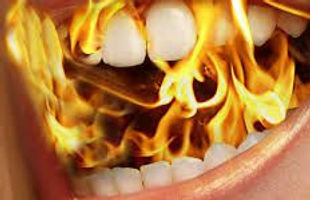 Dental work can cause flare-ups of our burning that can last weeks, months, or even years. What is a flare-up? It is when something raises your pain cycle from beginning to end and sometimes to a level that the medicines and coping strategies simply can’t handle. I experienced one when I had root canals on two molars about five years ago and it seemed to last forever until gradually, my regimen worked again and I was able to get back to my normal level of pain. Not really. If I let this go, I may end up with infection and abscess, extraction of the tooth, and then whatever they would come up with to keep my upper molar from growing down to the point that I would lose it, too. They might recommend an implant, which is something I have avoided so far. The root canal is by far the lesser of two evils, but I fear dental work of any kind at this point since this episode of BMS began with the replacement of two old crowns on my front teeth over ten years ago. Wish me luck, and feel free to ask any questions you may have. I can’t promise to be able to answer everything, but do check out the BMS Support Groups on Facebook and the Burning Mouth Support website, too! Very good news. The Endodontist was empathetic, listened, and did a 360 X-ray that revealed that although the root canal was not ideal, the shadowing that the regular X-rays hinted at was not concerning to him. He opted for a conservative option and so even though I will still need to get a new crown made, I will not have to endure a second root canal procedure. Will I still flare? Maybe. There will be no pain injections so from previous experience I am guessing that I may get a few days of escalation, but nothing near what I would have gotten with a root canal procedure.